When discussing which Wing Chun dummy is best we talked about how there are different mounting methods. Basically, there are different ways to keep the trunk of the dummy vertical and stable. In the past most Wing Chun dummies were mounted into an external frame, which held it in place. Some of them also can be mounted on the wall. But modern engineering and woodworking have come up with yet another way to support the trunk of the dummy, and that is by designing a free standing wooden dummy. Why Use a Free Standing Wooden Dummy? 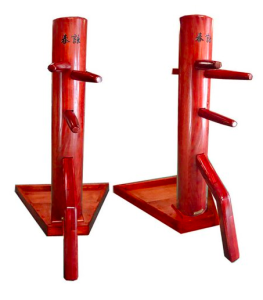 The free standing Wing Chun dummy model is usually made of two separate pieces. There is the trunk and the base. To assemble one of these you simply slide the trunk over the base. Some require additional bolting once attached, and you can even add weight to the back of most bases. This type of dummy has a number of benefits when compared to the traditional dummy. A lot of these are quite obvious. But, when you take a deeper look at what you can do with the dummy because of those surface benefits, it really shows the versatility of this design. The first glaringly obvious benefit is the simple fact that these take up a heck of a lot less real estate when compared to the traditional frame style mount. If that isn’t a clear enough bonus, then really think about what it means. Firstly, with a free standing model you can fit it into much smaller spaces, so you don’t need a separate room for the dummy. If absolutely necessary you could squeeze this into a bedroom or den. The smaller size also means that unlike the traditional mount and wall mount options, you can put this one in the corner. The other designs require a significant amount of wall space. This is probably the best option for those of you living in small apartments. Another benefit of free standing wooden dummies is that they are much easier to move than the traditional dummies. It doesn’t matter if you have your dummy or dummies in a large space like a school or training center, or in your home, the ability to move them around is extremely valuable. Perhaps you need more room for a performance or guests are visiting your home for the holidays, a free standing dummy is much more easily relocated than any other design. That doesn’t mean it’s a breeze to toss around though. These things are still rather heavy; so don’t expect to move it around on the daily basis unless you need some extra resistance training in your workout routine. If you need a wooden dummy but don’t have the luxury of lots of extra space, then a free standing dummy is a solid choice. They aren’t truly stationary like the traditional design, but they are just as solid. Furthermore, they won’t break your wallet either as they aren’t any more expensive than other wooden dummy models. What is a Wing Chun Attachmate? What is the greatest martial arts movie of all time?